Heralded as one of the most prestigious office buildings in the South West, the Aztec Centre was opened by Margaret Thatcher in 1989. 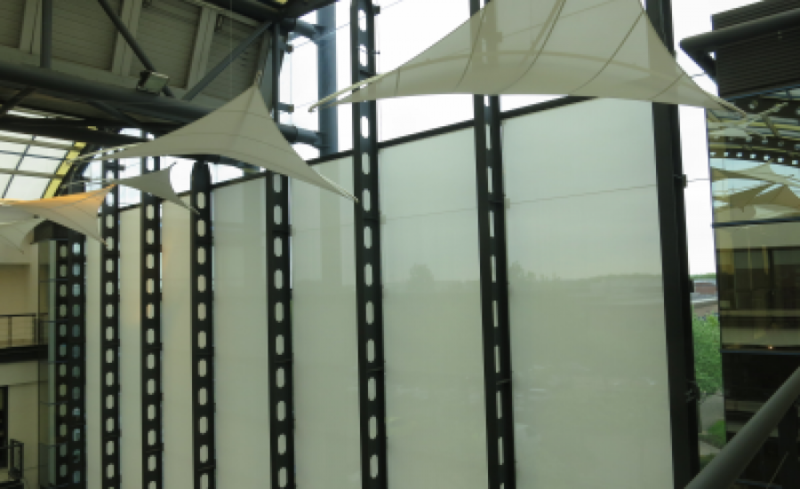 As part of an interior renovation to the central atrium, Architen was approached to design, manufacture and install a series of unique shade structures and shade screens. While glazed atriums with glass walls and roofs look great, they generate a lot of heat and solar glare, creating a greenhouse effect. 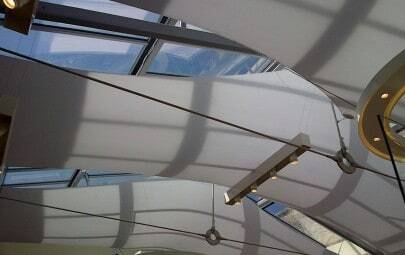 To control the solar glare, Architen designed two solutions using a white PVC coated glass cloth which requires little maintenance and will retain its bright white appearance for the life of the fabric. 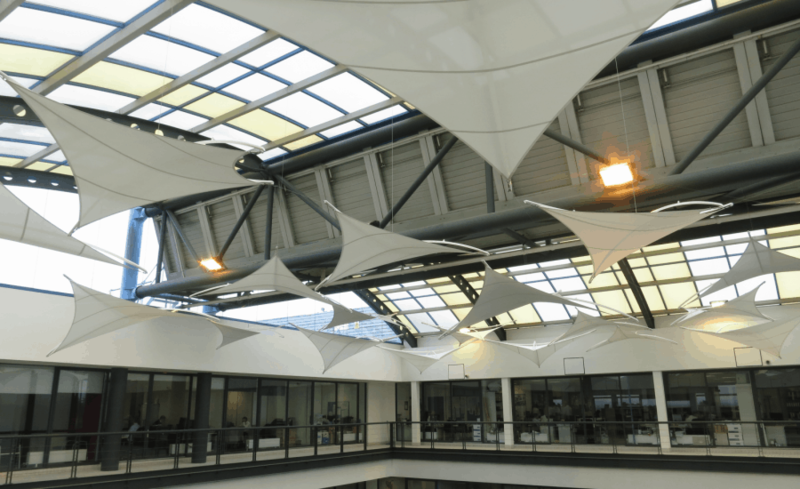 To help reduce some of the direct sun from the glazed roof, we installed multiple Hypars throughout the vast atrium. These beautifully designed sculptural tensile fabric structures appear to float in the space by almost invisible stainless steel cables. To create interest, structures vary from two to three meters in width. With no detail overlooked, connections and fittings are architectural grade polished stainless steel, adding to the modern finish. 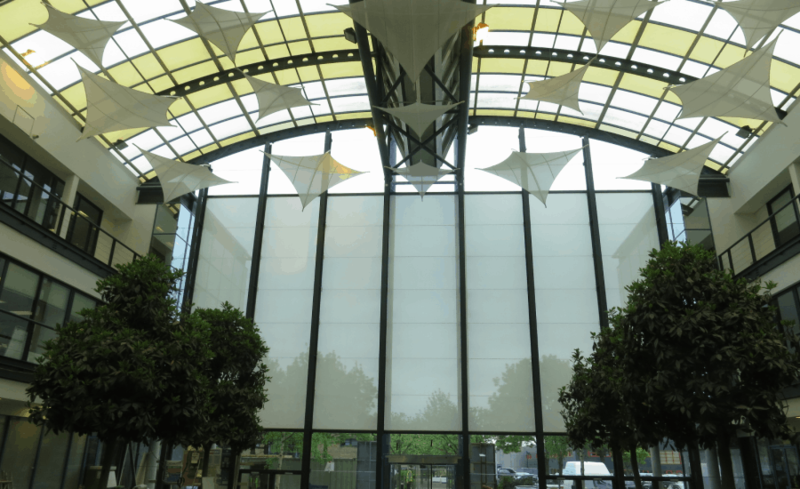 Seven bespoke flat solar shade screens were installed along the interior glazed wall. Architen designed clips specifically for the installation so that screens could be directly affixed to the existing buildings steelwork. 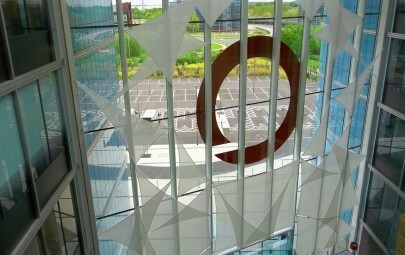 The clips allow screens to be removed for window cleaning. With the hypars and solar glare screens installed, the large space looks interesting and artistic. The glare has been reduced and the temperature is easier to control and maintain. 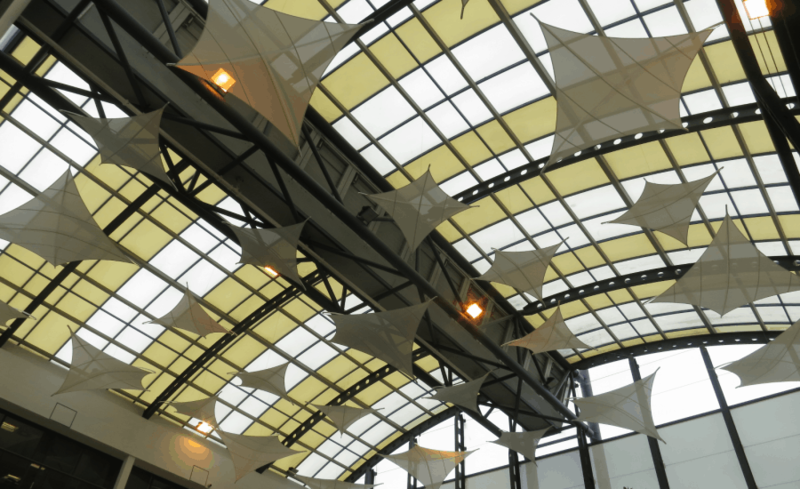 Installing tensile fabric structures inside offices, transportation venues and other public buildings is a quick and easy way to impact a space with added benefits such as: light reflectivity, solar control, and acoustics. 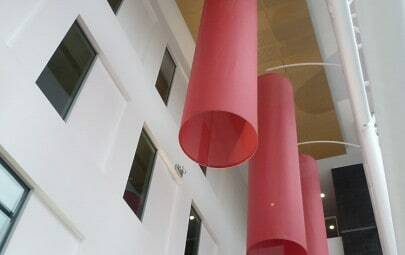 Click here to view other interior projects, or call us to discuss your project on 01291 638 200. Special thanks to Lancer Scott for their partnership in the project.